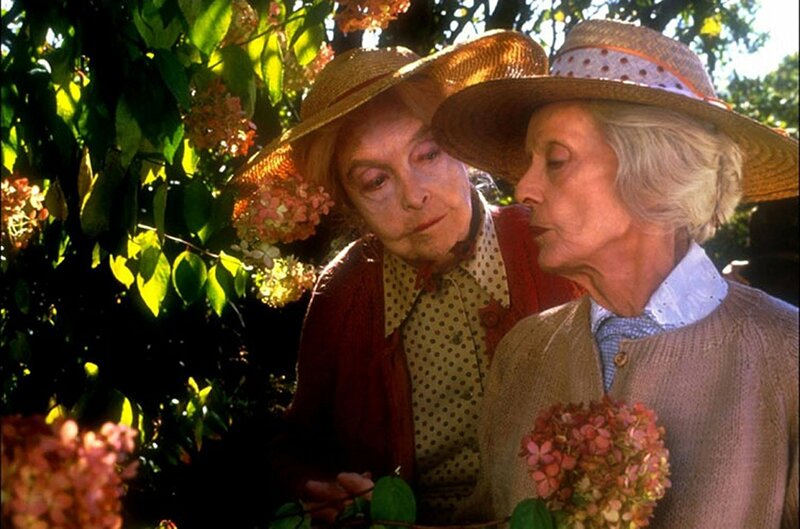 Two cinematic legends light up the screen in Lindsay Anderson's 1987 film, The Whales of August, starring the incomparable Bette Davis and Lillian Gish, along with Vincent Price and Ann Sothern. This marked the first time that Davis and Gish shared the screen, although Price had appeared with Davis previously in The Private Lives of Elizabeth and Essex in 1939. Gish was 93 years old and Davis was 79 when they made the film, making Gish (whose career began in 1912) the oldest woman ever to have a leading role in a film. And she is marvelous. The draw, of course, is watching the two icons together, but the film is much more than just an excuse to stargaze. It's a beautiful, elegiac rumination on aging (or as Price put it, "having aged") that focuses on two sisters in the twilight of their lives who live on the coast of Maine (beautifully rendered by cinematographer Mike Fash on the excellent new Kino Blu-Ray). Libby (Davis) and Sarah (Gish) have long spent their days taking turns taking care of each other. Now that Libby is blind, the burden has mostly fallen on her older sister. Libby is an eternal pessimist; Sarah, an indefatigable ray of hope. Together they live out their summers in their childhood home, playing host to their various neighbors; a Russian ex-pat turned fisherman (Price), Sarah's perky best friend, Tisha (Sothern), and an incorrigible old handyman (Harry Carey, Jr.). But as the summer winds down, and the coastal whales they so enjoy watching yet to make their appearance, Libby's defeatist determination that their lives are over and no longer worth living begins to weigh on Sarah, and she begins to consider what life without her sister might look like, moving forward rather than being stuck in the past. Based on the play by David Barry, The Whales of August has no traditional plot to speak of. It ebbs and flows with the tides, observing its characters' lives and allowing them to exist fully in the world it creates. The result is something that feels altogether real rather than dramatized, Gish and Davis seemingly two real sisters navigating their own day-to-day reality. They reminded me of my own grandmother and her sister, Barry's ear for dialogue perfectly capturing the essence of the shorthand spoken between two sisters who have had decades to perfect their communication. This would end up becoming the final film for both Gish and Sothern, while Davis would act in one more film before her death in 1989. That knowledge gives it an additional bittersweet power. Gish, her face still an angelic shadow of the young ingenue of the silent era; and Davis, her mouth drawn up from a stroke, steely eyes now faded but no less piercing, create an indelible portrait of reflecting on a life well lived. As Price's character observes, "one's time is always ones time, even until the end." 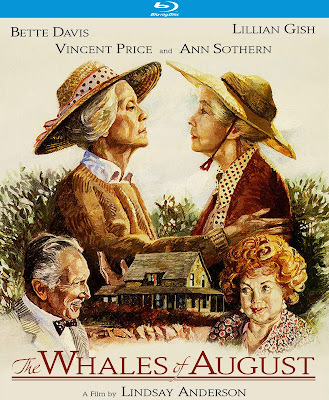 In The Whales of August, Davis and Gish make the most of the time they are given, and in so doing turn the film into a reflection on their long and storied careers, which in Gish's case went almost all the way back to the beginning of cinema itself. It's a deeply powerful work, filled with life and hope, gently reminding us that there is always more life yet to be lived, more adventures yet to be had, and more love yet to be felt. It's a quiet, unassuming masterpiece that deserves to be cherished, and has been given new life through the stunning new Blu-Ray from Kino Studio Classics, marking the series' finest achievement yet. THE WHALES OF AUGUST | Directed by Lindsay Anderson | Stars Bette Davis, Lillian Gish, Vincent Price, Ann Sothern, Harry Carey, Jr., Margaret Ladd, Mary Steenburgen | Not Rated | Now available on Blu-Ray and DVD from Kino Studio Classics.